Foreign bodies in the nose and airway are most common in children under the age of five years. Foreign bodies in the breathing tract may cause suffocation and death. This is one of the leading causes of unintentional death in the home, especially among children under the age of five years. Foreign bodies in the nose: Children usually place soft objects in their noses. Common objects include tissues, clay, pieces of toys, or erasers. They may do this because they are curious or copying other children. Sometimes a foreign body enters a child’s nose when he/she is smelling the object. 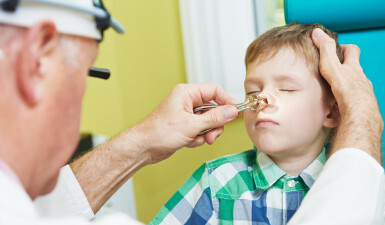 How do I know if my child has a foreign body in the nose? Nasal drainage is the most common symptom. The drainage appears only on the side of the nose with the object. It will most likely have a bad odor. The child may also have a bloody nose. How is a foreign body in the nose treated? The object must be removed promptly by a physician, either by using a machine with suction to pull it out or by inserting instruments into the nose. After removal, the physician may prescribe nose drops, antibiotic ointments, or oral antibiotics to treat any possible infection. Foreign bodies in the airway: FOREIGN BODIES IN THE AIRWAY ARE A MEDICAL EMERGENCY AND REQUIRE IMMEDIATE ATTENTION. The foreign body can get stuck in many different places within the airway. Foreign bodies in the airway account for nearly nine percent of all home accidental deaths in children under five years of age. Children tend to put things into their mouths when they are curious. The child may then inhale deeply, and the object may become lodged in the “airway tube” (trachea) instead of the “eating tube” (esophagus). You should always watch your child very closely to avoid a choking emergency. How are foreign bodies in the airway treated? A FOREIGN BODY IN THE AIRWAY IS A MEDICAL EMERGENCY AND YOU SHOULD SEEK EMERGENCY TREATMENT IMMEDIATELY. If the object is completely blocking the airway, the child will be unable to breathe or talk and his or her lips will become blue. Sometimes, surgery is necessary to remove the object. Children who are still talking and breathing but show other symptoms also need to be evaluated by a physician immediately.